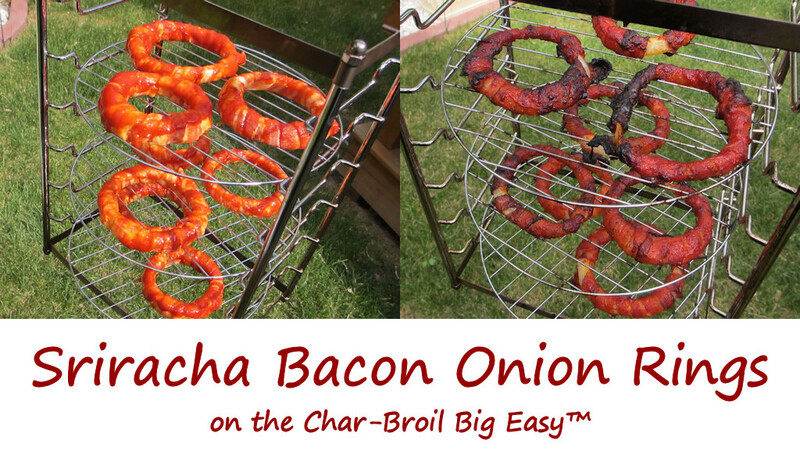 These Sriracha bacon onion rings that I made on my Char-Broil Big Easy give new meaning to kicked-up goodness. I mean, come on, what could be better than Sriracha and bacon? Now, these rings don’t get all super crispy like they’ve been deep-fried, but they more than make up for that with flavor. You can’t possibly make enough of these to satisfy your guests. You can serve the rings ‘as-is’, or do as I did and mix a few squirts of Sriracha and Ranch dressing together and use that as a dipping sauce. The cool Ranch helps cool off the spicy goodness, but it doesn’t hide it. Heck, I added Sriracha to it so it’s not like it’s wimpy. You can’t fit a whole bunch of Sriracha bacon onion rings on the standard basket that comes with your Big Easy. To really make a batch, you’ll need the Big Easy cooking rack available from Char-Broil. It adds a lot of cooking room. You can read my evaluation of the rack by clicking here. Love your Big Easy as much I love mine? Check out my Big Easy Add-Ons page and my free Big Easy eCookbook! In order to cook the full recipe amount below you'll need the Big Easy cooking rack. Otherwise, you'll have to divide the recipe up. Or at least use a Big Easy Bunk Bed basket to double the amount you can cook at once. Fire up your Big Easy. Slice the onion into thick 'steaks' about 1/2" thick. Push out the inner rings (save for another use), leaving the last two outer rings still together as one. Do not separate them. Note: If the rings are particularly thick then you can separate them as cook them as single rings. Place the rings on your Big Easy rack and lower into the Big Easy. Cook the rings until the bacon just starts to crisp. Gently flip them and cook another 10-15 minutes. Remove to a baking sheet and let firm up a bit.